Throughout the period of the armed peace Germany was making the pace and setting the tone for the rest of Europe. The influence of her new doctrines of aggressive imperialism was particularly strong upon the British mind, which was ill equipped to resist a strong intellectual thrust from abroad. The educational impulse the Prince Consort had given had died away after his death; the universities of Oxford and Cambridge were hindered in their task of effective revision of upper-class education by the fears and prejudices the so-called «conflict of science and religion» had roused in the clergy who dominated them through Convocation; popular education was crippled by religious squabbling, by the extreme parsimony of the public authorities, by the desire of employers for child labour, and by individualistic objection to «educating other people’s children». The old tradition of the English, the tradition of plain statement, legality, fair play, and a certain measure of republican freedom had faded considerably during the stresses of the Napoleonic wars; romanticism, of which Sir Walter Scott, the great novelist, was the chief promoter, had infected the national imagination with a craving for the florid and picturesque. «Mr. Briggs», the comic Englishman of Punch in the fifties and sixties, getting himself into highland costume and stalking deer, was fairly representative of the spirit of the new movement. It presently dawned upon Mr. Briggs as a richly colored and credible fact he had hitherto not observed, that the sun never set on his dominions. The country, which had once put Clive and Warren Hastings on trial for their unrighteous treatment of Indians, was now persuaded to regard them as entirely chivalrous and devoted figures. They were «empire builders». Under the spell of Disraeli’s Oriental imagination, which had made Queen Victoria «empress», the Englishman turned readily enough towards the vague exaltations of modern imperialism. The perverted ethnology and distorted history which was persuading the mixed Slavic, Keltic, and Teutonic Germans that they were a wonderful race apart, was imitated by English writers who began to exalt a new ethnological invention, the «Anglo-Saxon». This remarkable compound was presented as the culmination of humanity, the crown and reward of the accumulated effort of Greek and Roman, Egyptian, Assyrian, Jew, Mongol, and such-like lowly precursors of its white splendor. The senseless legend of German superiority did much to exacerbate the irritations of the Poles in Posen and the French in Lorraine. The even more ridiculous legend of the superior Anglo-Saxon did not merely increase the irritations of English rule in Ireland, but it lowered the tone of British dealings with «subject» peoples throughout the entire world. For the cessation, of respect and the cultivation of «superior» ideas are the cessation of civility and justice. Yet the imperialist movement in Great Britain never had the authority nor the unanimity it had in Germany. It was not it natural product of any of the three united but diverse British peoples. It was not congenial to them. Queen Victoria and her successors, Edward VII and George V, were indisposed, either by temperament or tradition, to wear «shining armour», shake «mailed fists», and flourish «good swords» in the Hohenzollern fashion. They had the wisdom to refrain from any overt meddling with public ideas. And this «British» imperialist movement had front the first aroused the hostility of the large number of English, Welsh, Irish, and Scotch writers who refused to recognize this new «British» nationality or to accept the theory that they were these «Anglo-Saxon» supermen. And many great interests in Britain, and notably the shipping interest, had been built up upon free trade, and regarded the fiscal proposals of the new imperialists, and the new financial and mercantile adventurers with whom they were associated, with a justifiable suspicion. On the other hand, these ideas ran like wildfire through the military class, through Indian officialdom and the like. Hitherto there had always been something apologetic about the army man in England. He was not native to that soil. Here was a movement that promised to make hint as splendidly important as his Prussian brother in arms And the imperialist idea also found support in the cheap popular press that was now coming into existence to cater for the new stratum of readers created by elementary education. This press wanted plain, bright, simple ideas adapted to the needs of readers who had scarcely begun to think. In spite of such support, and its strong appeal to national vanity, British imperialism never saturated the mass of the British peoples. The English are not a mentally docile people, and the noisy and rather forced enthusiasm for imperialism and higher tariffs of the old Tory Party, the army class, the country clergy, the music-halls, the assimilated alien, the vulgar rich and the new large employers, inclined the commoner sort, and particularly organized labour, to a suspicious attitude. If the continually irritated sore of the Majuba defeat permitted the country to be rushed into the needless, toilsome and costly conquest of the Boer republics in South Africa, the strain of that adventure produced a sufficient reaction towards decency and justice to reinstate the Liberal Party in power, and to undo the worst of that mischief by the creation of a South African confederation. Considerable advances continued to be made in popular education, and in the recovery of public interests and the general wealth from the possession of the few. And in these years of the armed peace, the three British peoples came very near to a settlement, on fairly just and reasonable lines, of their long-standing misunderstanding with Ireland. The Great War unluckily for them overtook them in the very crisis of this effort. Like Japan, Ireland has figured but little in this Outline of History, and for the same reason, because she is an extreme island country, receiving much, but hitherto giving but little back into the general drama. Her population is a very mixed one, its basis, and probably its main substance, being of the dark «Mediterranean» strain, pre-Nordic and pre-Aryan, like the Basques and the people of Portugal and south Italy. Over this original basis there flowed, about the sixth century B.C. we do not know to what degree of submergence a wave of Keltic peoples, in at least sufficient strength to establish a Keltic language, the Irish Gaelic. There were comings and goings, invasions and counter-invasions of this and that Keltic or Kelticized people between Ireland, Scotland, Wales, and England. The island was Christianized in the fifth century. Later on the east coast was raided and settled by Northmen, but we do not know to what extent they altered the racial quality. The Norman-English came in 1169, in the time of Henry II and onward. The Teutonic strain may be as strong or stronger than the Keltic in modern Ireland. Hitherto Ireland had been a tribal and barbaric country, with a few centers of security wherein the artistic tendencies of the more ancient race found scope in metal work and the illumination of holy books. Now, in the twelfth century, there was an imperfect conquest by the English Crown, and scattered settlements by Normans and English in various parts of the country. From the outset profound temperamental differences between the Irish and English were manifest, differences exacerbated by a difference of language, and these became much more evident after the Protestant Reformation. The English became Protestant; the Irish by a natural reaction rallied about the persecuted Catholic Church. The English rule in Ireland had been from the first an intermittent civil war due to the class of languages and the different laws of land tenure and inheritance of the two peoples. The rebellions, massacres, and subjugations of the unhappy island during the reigns of Elizabeth and James I we cannot tell of here; but under James came a new discord with the confiscation of large areas of Ulster and their settlement with Presbyterian Scotch colonists. They formed a Protestant community in necessary permanent conflict with the Catholic remainder of Ireland. In the political conflicts during the reign of Charles I and the Commonweal, and of James II and William and Mary, the two sides in English affairs found sympathizers and allies in the Irish parties. There is a saying in Ireland that England’s misfortune is Ireland’s opportunity, and the English civil trouble that led to the execution of Strafford was the occasion also of a massacre of the English in Ireland (1641). Later on Cromwell was to avenge that massacre by giving no quarter to any men found under arms, a severity remembered by the Irish Catholics with extreme bitterness. 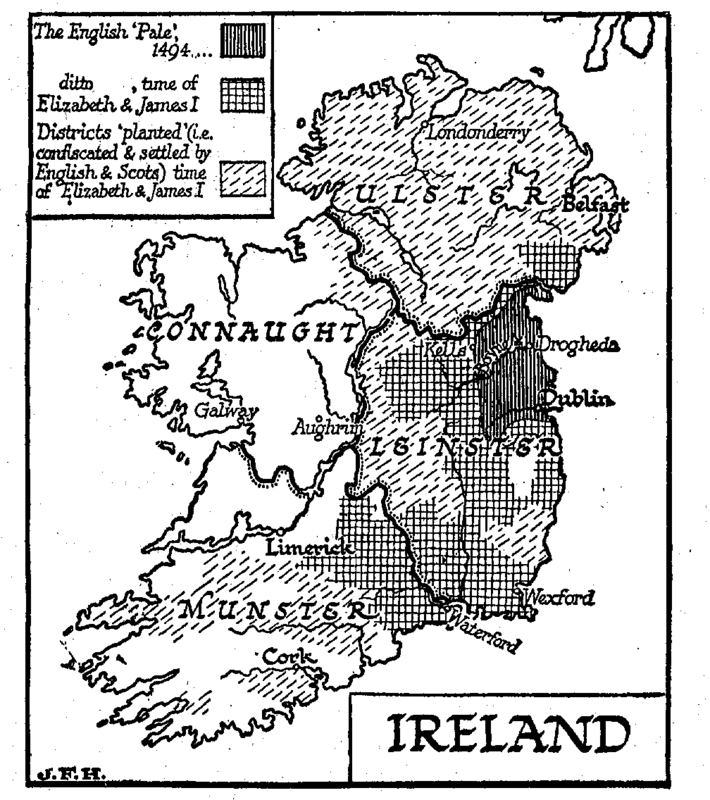 Between 1689 and 1691 Ireland was again torn by civil war. James II sought the support of the Irish Catholics against William III, and his adherents were badly beaten at the battles of the Boyne (1690) and Aughrim. (1691). There was a settlement, the Treaty of Limerick, a disputed settlement in which the English Government promised much in the way of tolerance for Catholics and the like, and failed to keep its promises. Limerick is still a cardinal memory in the long story of Irish embitterment. Comparatively few English people have even beard of this Treaty of Limerick; in Ireland it rankles to this day. The eighteenth century was a century of accumulating grievance. English commercial jealousy put heavy restraints upon Irish trade, and the development of a wool industry was destroyed in the south and west. The Ulster Protestants were treated little better than the Catholics in these matters, and they were the chiefs of the rebels. There was more agrarian revolt in the north than in the south in the eighteenth century. Let us state as clearly as our space permits the parallelisms and contrasts of the British and Irish situation at this time. There was a parliament in Ireland, but it was a Protestant parliament, even more limited and corrupt than the contemporary British Parliament; there was a considerable civilization in and about Dublin, and much literary and scientific activity, conducted in English and centering upon the Protestant university of Trinity College. This was the Ireland of Swift, Goldsmith, Burke, Berkeley, and Boyle. It was essentially a part of the English culture. It had nothing distinctively Irish about it. The Catholic religion and the Irish language were outcast and persecuted things in the darkness at this time. It was from this Ireland of the darkness that the recalcitrant Ireland of the twentieth century arose. The Irish Parliament, its fine literature, its science, all its culture, gravitated naturally enough to London, because they were inseparably a part of that world. The more prosperous landlords went to England to live, and had their children educated there. This meant a steady drain of wealth from Ireland to England in the form of rent, spent or invested out of the country. The increasing, facilities of communication steadily enhanced this tendency, depleted Dublin and bled Ireland white. The Act of Union (January 1st, 1801) was the natural coalescence of two entirely kindred systems, of the Anglo-Irish Parliament with the British Parliament. both oligarchic, both politically corrupt in the same fashion. There was a vigorous opposition to the Union on the part not so much of the outer Irish as of Protestants settled in Ireland, and a futile insurrection under Robert Emmet in 1803. Dublin, which had been a fine Anglo-Irish city in the middle eighteenth century, was gradually deserted by its intellectual and political life, and invaded by the outer Irish of Ireland. Its fashionable life became more and more official, centering upon the Lord Lieutenant in Dublin Castle; its intellectual life flickered and for a time nearly died. But while the Ireland of Swift and Goldsmith was part and lot with the England of Pope, Dr. Johnson, and Sir Joshua Reynolds, while there has never been and is not now any real definable difference except one of geography between the «governing class» in Ireland and in Britain, the Irish underworld and the English underworld were essentially dissimilar. The upward struggle of the English «democracy» to education, to political recognition, was different in many respects from the struggle of the Irish underworld. Britain was producing a great industrial population, Protestant or skeptical; she had agricultural laborers indeed, but no peasants. Ireland, with no coal, with a poorer soil and landlords who lived in England, had become a land of rent- paying peasants. Their cultivation was allowed to degenerate more and more into a growing of potatoes and a feeding of pigs. The people married and bred; except for the consumption of whisky when it could be got, and a little fighting, family life was their only amusement. Here are the appalling consequences. The population of Ireland in 1785 was 2,845,932, in 1803 was 5,536,594, in 1845 was 8,295,061, at which date the weary potato gave way under its ever-growing burthen and there was a frightful famine. Many died, many immigrated, especially to the United States; an outflow of emigration began that made Ireland for a time a land of old People and empty nests. Now because of the Union of the Parliaments, the enfranchisement of the English and Irish populations went on simultaneously. Catholic enfranchisement in England meant Catholic enfranchisement in Ireland. The British got votes because they wanted them; the Irish commonalty got votes because the English did. Ireland was over-represented in the Union Parliament, because originally Irish seats had been easier for the governing class to manipulate than English; and so it came about that this Irish and Catholic Ireland, which had never before had any political instrument at all, and which had never sought a political instrument, suddenly found itself with the power to thrust a solid body of members into the legislature of Great Britain. After the general election of 1874, the old type of venal Irish member was swept aside, and the newly enfranchised «democracy» of Britain found itself confronted by a strange and perplexing Irish «democracy», different in its religion, its traditions, and its needs, telling a tale of wrongs of which the common English had never heard, clamoring passionately for a separation which they could not understand and which impressed them chiefly as being needlessly unfriendly. The national egotism of the Irish is intense; their circumstances have made it intense; they were incapable of considering the state of affairs in England; the new Irish party came into the British Parliament to obstruct and disorder English business until Ireland became free, and to make themselves a nuisance to the English. This spirit was only too welcome to the oligarchy which still ruled the British Empire; they allied themselves with the «loyal» Protestants in the north of Ireland -loyal that is to the Imperial Government because of their dread of a Catholic predominance in Ireland-and they watched and assisted the gradual exasperation of the British common people by this indiscriminate hostility of the common people of Ireland. The story of the relation of Ireland to Britain for the last half-century is one that reflects the utmost discredit upon the governing class of the British Empire, but it is not one of which the English commons need be ashamed. Again and again they have given evidences of goodwill. British legislation in relation to Ireland for nearly half a century shows a series of clumsy attempts on the part of liberal England, made in the face of a strenuous opposition from the Conservative Party and the Ulster Irish, to satisfy Irish complaints and get to a footing of fellowship. The name of Parnell, an Irish Protestant, stands out as that of the chief leader of the Home Rule movement. In 1886 Gladstone, the liberal British prime minister, brought political disaster upon himself by introducing the first, Irish Home Rule Bill, a genuine attempt to give over Irish affairs for the first time in history to the Irish peo ple. The bill broke the Liberal Party asunder; and a coalition government, the Unionist Government, replaced that of Mr. Gladstone. This digression into the history of Ireland now comes up to the time of infectious imperialism in Europe. The Unionist Government, which ousted Mr. Gladstone, had a predominantly Tory element, and was in spirit «imperialist» as no previous British Government had been. The British political history of the subsequent years is largely a history of the conflict of the new imperialism, through which an arrogant «British» nationalism sought to override the rest of the empire against, the temperamental liberalism and reasonableness of the English, which tended to develop the empire into a confederation of free and willing allies. Naturally the «British» imperialist wanted a subjugated Irish; naturally the English Liberals wanted a free, participating Irish In 1892 Gladstone struggled back to power with a small Home Rule majority; and in 1893 his second Home Rule Bill passed, the Commons, and was rejected by the Lords. It was not, however, until 1895 that an imperialist government took office. The party, which sustained it was called not Imperialist, but «Unionist» an odd name, when we consider how steadily and strenuously it has worked to destroy any possibility of an Empire commonweal. These Imperialists remained in power for ten years. We have already noted their conquest of South Africa. They were defeated in 1905 in an attempt to establish a tariff wall on the Teutonic model. The ensuing Liberal Government then turned the conquered South African Dutch into contented fellow subjects by creating the self-governing Dominion of South Africa. After which it embarked upon a long-impending struggle with the persistently imperialist House of Lords. This was a very fundamental struggle in British affairs. On the one hand were the Liberal majority of the people of Great Britain honestly and wisely anxious to put this Irish affair upon a new and more hopeful footing, and, if possible, to change the animosity of the Irish into friendship; on the other were all the factors of this new British Imperialism resolved at any cost and in spite of every electoral verdict, legally, if possible, but if not, illegally, to maintain their ascendancy over the affairs of the English, Scotch, and Irish and all the rest of the empire alike. It was, under new names, the age-long internal struggle of the English community; that same conflict of a free and liberal- spirited commonalty against powerful «big men» and big adventurers and authoritative persons which we have already dealt with in our account of the liberation of America. Ireland was merely a battleground as America had been. In India, in Ireland, in England, the governing class and their associated adventurers were all of one mind; but the Irish people, thanks to their religious difference, had little sense of solidarity with the English. Yet such Irish statesmen as Redmond, the leader of the Irish party in the House of Commons, transcended this national narrowness for a time, and gave a generous response to English good intentions. Slowly yet steadily the barrier of the House of Lords was broken down, and a third Irish Home Rule Bill was brought in by Mr. Asquith, the Prime Minister, in 1912. Throughout 1913 and the early part of 1914 this bill was fought and refought through Parliament. At first it gave Home Rule to all Ireland; but an Amending Act, excluding Ulster on certain conditions, was promised. Thus struggle lasted right up to the outbreak of the Great War. The royal assent was given to this bill after the actual outbreak of war, and also to a bill suspending the coming into force of Irish Home Rule until after the end of the war. These bills were put upon the Statute Book. But from the introduction of the third Home Rule Bill onward, the opposition to it had assumed a violent and extravagant form. Sir Edward Carson, a Dublin lawyer who had become a member of the English Bar, and who had held a legal position in the ministry of Mr. Gladstone (before the Home Rule split) and in the subsequent imperialist government, was the organizer and leader of this resistance to a reconciliation of the two peoples. In spite of his Dublin origin, he set up to be a leader of the Ulster Protestants; and he brought to the conflict that contempt for law, which is all too common a characteristic of the successful barrister, and those gifts of persistent, unqualified, and uncompromising hostility, which distinguish a certain type of Irishman. He was the most «unEnglish» of men, dark, romantic, and violent; and from the opening of the struggle he talked with gusto of armed resistance to this freer reunion of the English and Irish, which the third Home Rule Bill contemplated. A body of volunteers had been organized in Ulster in 1911, arms were now smuggled into the country, and Sir Edward Carson and a rising lawyer named F. E. Smith, trapped up in semi-military style, toured Ulster, inspecting these volunteers and inflaming local passion. The arms of these prospective rebels were obtained from Germany, and various utterances of Sir Edward Carson’s associates hinted at support from «a great Protestant monarch». Contrasted with Ulster, the rest of Ireland was at that time a land of order and decency, relying upon its great leader Redmond and the good faith of the three British peoples. Now these threats of c ivil war from Ireland were not in themselves anything very exceptional in the record of that unhappy island; what makes them significant in the world’s history at this time is the vehement support they found among the English military and governing classes, and the immunity from punishment and restraint of Sir Edward Carson and his friends. The virus of reaction, which came from the success and splendor of German imperialism had spread widely, as we have explained, throughout the prevalent and prosperous classes in Great Britain. A generation had grown up forgetful of the mighty traditions of their forefathers, and ready to exchange the greatness of English fairness and freedom for the tawdriest of imperialisms. A fund of a million pounds was raised, chiefly in England, to support the Ulster Rebellion, an Ulster Provisional Government was formed, prominent English people mingled in the fray and careered about Ulster in automobiles, assisting in the gun-running, and there is evidence that a number of British officers and generals were prepared for a pronunciamento upon South American lines rather than obedience to the law. The natural result of all this upper-class disorderliness was to alarm the main part of Ireland, never a ready friend to England. That Ireland also began in its turn to organize «National Volunteers» and to smuggle arms. The military authorities showed themselves much keener in the suppression of the Nationalist than of the Ulster gun importation, and in July, 1914, an attempt to run guns at Howth, near Dublin, led to fighting and bloodshed in the Dublin streets. The British Isles were on the verge of civil war. Such in outline is the story of the imperialist revolutionary movement in Great Britain up to the eve of the Great War. For revolutionary this movement of Sir Edward Carson and his associates was. It was plainly an- attempt to set aside parliamentary government and the slow-grown, imperfect liberties of the British peoples, and, with the assistance of the army, to substitute a more Prussianized type of rule, using the Irish conflict as the point of departure. It was the reactionary effort of a few score thousand people to arrest the world movement towards democratic law and social justice, strictly parallel to and closely sympathetic with the new imperialism of the German junkers and rich men. But in one very important respect British and German imperialism differed. In Germany it centered upon the crown; its noisiest, most conspicuous advocate was the heir-apparent. In Great Britain the king stood aloof. By no single public act did King George V betray the slightest approval of the new movement, and the behavior of the Prince of Wales his son and heir, has been equally correct. In August, 1914, the storm of the Great War burst upon the world. In September, Sir Edward Carson was denouncing the placing of the Home Rule Bill upon the Statute Book. On the same day, Mr. John Redmond, the leader of the Irish majority, the proper representative of Ireland, was calling upon the Irish people to take their equal part in the burthen and effort of the war. For a time Ireland played her part in the war side by side with England faithfully and well, until in 1915 the Liberal Government was replaced by a coalition, in which, through the moral feebleness of Mr. Asquith, the prime minister, this Sir Edward Carson figured as Attorney General (with a salary of 7,000 and fees), to be replaced presently by his associate in the Ulster sedition, Sir F. E. Smith. Grosser insult was never offered to a friendly people. The work of, reconciliation, begun by Gladstone in 1886, and brought so near to completion, in 1914, was completely and finally wrecked. In the spring of 1916 Dublin revolted unsuccessfully against this new government. The ringleaders of this insurrection, many of them were boys, were shot with a deliberate and clumsy sternness that, in view of the treatment of the Ulster rebel leaders, impressed all Ireland as atrociously unjust. A traitor, Sir Roger Casement, who had been knighted for previous services to the empire, was tried and executed, no doubt deservedly, but his prosecutor was Sir F. E. Smith of the Ulster insurrection, a shocking conjunction. The Dublin revolt had had little support in Ireland generally, but thereafter the movement for an independent republic grew rapidly to great proportions. Against this strong emotional drive there struggled the more moderate ideas of such Irish statesmen as Sir Horace Plunkett, who wished to see Ireland become a Dominion, a «crowned republic» that is, within the empire, on an equal footing with Canada and Australia. When in December, 1919, Mr. Lloyd George introduced his Home Rule Bill into the Imperial Parliament there were no Irish members, except Sir Edward Carson and his followers, to receive it. The rest of Ireland was away. It refused to begin again that old dreary round of hope and disappointment. Let the British and their pet Ulstermen do as they would, said the Irish.